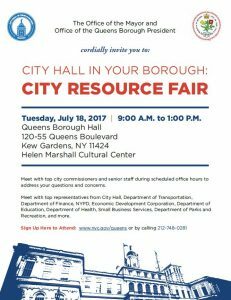 As part of the upcoming Queens edition of “City Hall in Your Borough,” Mayor Bill de Blasio and Borough President Katz will host a City Resource Fair on Tuesday, July 18 from 9 a.m. to 1 p.m. in the Helen Marshal Cultural Center in Queens Borough Hall at 120-55 Queens Boulevard, Kew Gardens. City Commissioners and other top representatives from City agencies will answer questions from Queens residents during the fair. Queens residents who plan to attend should sign up in advance at nyc.gov/Queens or by calling (212) 748-0281. Mayor de Blasio and his staff will be working out of Queens Borough Hall from Monday, July 17 through Friday, July 21 as part of the “City Hall in Your Borough” initiative, which will also include a town hall, a mayoral cabinet meeting and other events throughout Queens. Stay tuned for updates on other public events that will be held that week.